William Phillips Hand Signed and Numbered Limited Edition Canvas Giclee:"Release Your Brakes and Hunt for Heaven"
Edition: Artist Signed and Numbered, Limited to 75 total editions. COA included. About the Art: Beginning 1 March 1942, in preparation for the famous Doolittle Raid on Tokyo, twenty-four crews were selected to pick up modified B-25 bombers in Minneapolis and fly them to Eglin Field, Florida. There the crews received intensive training for three weeks in simulated carrier deck takeoffs, low-level and night flying, low-altitude bombing and over-water navigation, primarily out of Wagner Field, Auxiliary Field 1. 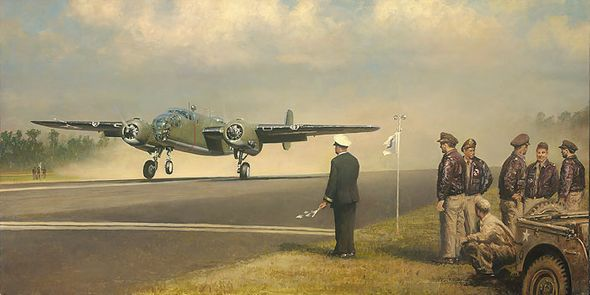 Here William Phillips depicts Lieutenant Henry Miller, USN, from nearby Naval Air Station Pensacola supervising the takeoff training which would prepare sixteen selected crews to launch from the USS Hornet on 18 April 1942 to attack Tokyo and other designate sites in Japan. As a side note, for his efforts, Lt. Miller is considered an honorary member of the Doolittle Raiders.